Phoebe Stockdale of Kall Kwik emerged as the recipient of the GQA Sponsored Apprentice of the Year at the Proskills Apprenticeship Awards, Alton Towers. 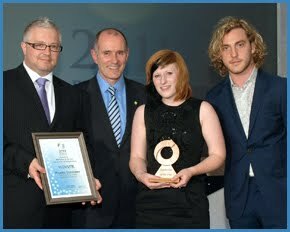 Phoebe was announced the winner by the evening's MC, Seann Walsh, and she joined Seann, Proskills' Terry Watts and GQA's Mick Clayton on stage to receive her award. GQA are very proud to sponsor the Proskills Apprentice of the Year award and are committed to ensuring quality qualifications are available to the Proskills industries, Glass, Print and Coatings.